Teresa Margarida Santos was born in Sarrazola ( Cacia ) on February 22, 1954 . She graduated in Chemistry-Educational Branch, Faculty of Sciences, University of Porto (1977) . 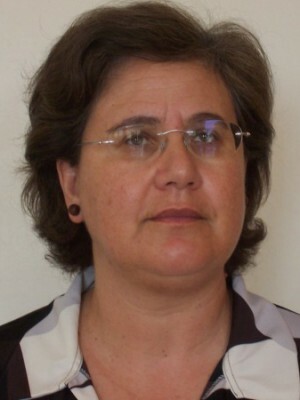 After "Scientific and Pedagogical Capacity Skill Profs" in the Chemistry Department of University of Aveiro, in 1987, obtained her PhD in Chemistry ( Inorganic ) in 1995, also at Aveiro University, under Professor Júlio Pedrosa de Jesus supervision, with the thesis "Coordination Chemistry of Cr(III) and Cr(VI) compounds related with the biological effects of Chromium". Before landing in Aveiro she was a High School Teacher across the country, with a brief passage in UTAD University. Since 1983 her professional activities have been developed in the Chemistry Department of the University of Aveiro, where she is Assistant Professor. Inorganic Chemistry / Coordination Chemistry: design, synthesis and characterization of new coordination compounds of biological interest. In particular ruthenium(II) with macrocyclic and other ligands (polypyridilic, aminoacids and DNA bases, etc. ), and also copper (I/II) and iron(II/III) as models of anti-tumor or cytotoxic agents. Interaction of these compounds with base sequences and / or DNA. Synthesis of new complexes for studying mechanisms of toxicity in vitro and in vivo (chromium and ruthenium). Synthesis and characterization of "extended" structures with bridging ligands. Chemistry of Materials: mesoporous and lamellar structures with supported compounds for applications in catalysis. Other interests: Chemistry in Education - new pedagogical strategies in Secondary School. Laboratory disciplines: Environmental Inorganic Chemistry; Chemistry I; Chemistry II; Q 303; Q 416; Q 506; Q 626; Inorganic Chemistry II; Laboratory I; Project (final discipline in Licenciatura). Has been very active in supervising Teaching Practice in various basic and secondary schools in the region of Aveiro. Projecto STRIDE "Química e Bioquímica da toxicidade de compostos de crómio" (1992-1995), (member of the team). Projecto STRIDE "Modificação Química de Fibras Vegetais por iões inorgânicos para a produção de biocompósitos" (1992-1995), (member of the team). Projecto do Senado da Universidade de Aveiro “Complexos de Ru(II) com ligandos macrocíclicos e polipiridílicos: caracterização estrutural, estudo por espectrometria de massa dos produtos das reacções in vitro com oligonucleótidos e avaliação da sua toxicidade in vivo” (1997-2000) (member of the team). PRAXIS/PCEX/QUI/0122/96 Project “Ruthenium(II) complexes with macrocyclic polyridyl containing ligands: synthesis , structural characterisation, molecular modelling, in vitro studies of their DNA interactions and in vivo evaluation of their toxicity” (1998-2001), (member of the team). Luso-German Action - CRUP (A-15/99):“Bimetallic M….M Catalysts stabilized by solvent molecules: synthesis and catalytic applications” (1998-2000),(member of the team). Luso-Spanish Action-CRUP(E-60/00): “Synthesis and characterisation of new ruthenium(II) polypyridylic complexes. Electropolymerization and applications in catalysis” (2000-2002) (portuguse coordinator). SAPIENS Project (1999/QUI/32889): “Heteregenization of complexes with catalytic and photochemical activities in mesoporous oxides”(1999-2002), (member of the team). SAPIENS Project (POCTI/2001/QUI/42883): “Study of the oligodessoxyribonucleotide duplexes with ruthenium(II) complexes by mass spectrometry”(2002-2004), (member of the team). I&DT Project (Health Sciences / Universidade de Aveiro):“Traditional and innovative diagnosis techniques in the biomonotoring of the effects of metals in mice: hematologigical and male fertility studies” (2002-2005), (member of the team). POCTI Project (POCTI/CTM/58507/2004): “Multifunctional anionic clays”(2005-2008), (member of the team). PhD Thesis (Chemistry Department, UA,1995):“Química de coordenação de Crómio relacionada com os efeitos biológicos de compostos de Cr(III) e de Cr(VI)”. Cr(VI) induced alterations in mouse spleen cells. A short term assay, R. P. Neves, T. M. Santos, M. L. Pereira, J. P. de Jesus, Cytobios, 2001,106,S1,27-34. Comparative Histological Studies on Liver of Mice Exposed to Cr(VI) and Cr(V), R. P. Neves, T. M. Santos, M. L. Pereira, J. P. de Jesus, Human Experm Toxicol, 2002, 21(7), 365-369. Cr(V) involvement in the toxicity pathway of testis damage, M. L. Pereira, T. M. Santos, R P. Neves, F.G. Costa, J. P. de Jesus, Asian J Androl, 2002, 4(2), 153-155. Functional changes of mice Sertoli cells induced by Cr(V), M. L. Pereira, T. M. Santos, F G e Costa, J. P de Jesus, Cell Mol Biol, 2004, 20(5), 285-291. Effect of Cr(V) on reproductive organs, morphology and sperm parameters: na experimental study in mice, M. L. Pereira, R. P. Neves, H. Oliveira, T. M. Santos, J. Pedrosa de Jesus, Environ. Health:a Global Access Science Source, 2005, 4(9), 1-8. Histopathological effects of hexavalent chromium in mice kidneys, H. Oliveira, T. M. Santos, J. Ramalho-Santos, M. L. Pereira, Bull. Environ. Contam. Toxicol. 2006, 76(6), 977-983. Evaluation of in vivo reproductive toxicity of potassiumchromate in male mice, Helena Oliveira, Marcello Spanó, Miguel A. Guevara, Teresa M. Santos, Conceição Santos, M. Lourdes Pereira, Experimental and Toxicologic Pathology, 2010, 62, 391-404. A kinetic and equilibrium study of the reaction of potassium and sodium bis-cysteinato(N,O,S)-Cr(III) in moderately acidic solutions, P. O´Brien, J. P. de Jesus, T. M. Santos, Inorg Chim Acta, 1987, 131,5-7. On the CD of tris(S-alaninato)Cr(III):absolute configurations and evidence for unexpected lability, J. P. de Jesus, T. M. Santos, P. O´Brien, Polyhedron, 1991, 10, 575-577. Solution studies of some chromium(III) complexes with Cr-S bonds. 2-Kinetic and equilibrium studies of cysteinato and penicillaminato-Cr(III) complexes, T. M. Santos, J. P. de Jesus, P. O´Brien, Polyhedron,1992,11,1687-1695. Characterization of a-aminoacidato Cr(III) complexes by FAB MS, T. M. Santos, J. P. de Jesus, F. Amado, P. Domingues, M. G. S.-Marques, A. F.-Correia, Polyhedron, 1996, 15, 2887-2894. Synthesis and structural characterisation of new Ru(II)aneS4 complexes with polypyridylic and related ligands, T. M. Santos, B. Goodfellow, J. Madureira, J. P. de Jesus, V. Félix, M. Drew, New J Chem, 1999, 23, 1015-1025. Structural characterization of new Ru(II)aneS3 polypyridylic complexes, J. Madureira, T. M. Santos, B. Goodfellow, M. Lucena, J. P. de Jesus, M. G. S.-Marques, M. Drew, V. Félix, Dalton Trans, 2000, 23, 4422-4431. Unusual chloride versus macrocycle competition in Ru(II)(aneS3)(HCpz3)Cl+:a combined theoretical and experimental study, A. M. Amado, V. Félix, J. Madureira, T. M. Santos, P. R.-Claro, J Inorg Biochem, 2001, 86(1), 123-B. Interaction of Ru(II)-dipyridophenazine complexes with CT-DNA: effects of the polythioether ancillary ligands, T. M. Santos, J. Madureira, V. Félix, B. Goodfellow, Metal-Based Drugs, 2001, 8(3), 125-136. Characterization and differentiation of Ru(II) complexes with aneS3 and N heterocycles by ES-MS,MG S-Marques, F. Amado,A F-Correia,M Lucena,J Madureira, B. Goodfellow, V. Félix, TM Santos, J Mass Spect, 2001, 36, 529-537. Ru(II) Electron-Transfer Systems Incorporating S-donor Ligands, C. Araújo, M. Drew, V. Félix, L. Jack, J. Madureira, M. Newell, S. Roche, T. M. Santos, J. A. Thomas, L. Yellowlees, Inorg Chem, 2002, 41, 2250-2259. Structural characterisation and DFT studies of [Cr(cyclam)(O-dmso)Cl]2+: a new precursor complex towards potential DNA intercalators, V. Félix, T. M. Santos, J. Madureira, F. Mirante, S. Quintal, B. Goodfellow, M. G. Santana-Marques, Júlio P de Jesus, M. Drew, M. J. Calhorda, Inorg Chim Acta, 2003, 356, 335-342. Synthesis, structure and redox properties of a new aqua Ru complex containing tridentate aneS3 and didentate 1,10-phennatroline ligands, X. Sala, A. Poater, I. Romero, M. Rodriguez, A. Llobet, X. Solans, T. Parella, T. M. Santos, Eur J Inorg Chem, 2004, 612-618. Gas-phase C-S bond cleavage and crown opening versus nitrogen heterocycle loss from Ru-II complex ions with 1,4,7,10-tetrathiacyclododecane and bidentate diimines, R. A. Izquierdo, C. Barros,F. M. L. Amado, M. G. O. Santana-Marques, A. J. Ferrer-Correia, J. Madureira, T. M. Santos, V. Felix, Intern J of Mass Spectrometry, 2005, 243 (3): 257-268. Dppz-pda: a new hetero-bridging dppz based ligand for metal transition coordination chemistry, Teresa M. Santos, J. Madureira, V. Félix, J. Biological Inorganic Chemistry, 2007, 12 (Suppl. 1), S-119-S-152. Complex DNA-Binding Kinetics Resolved by Combined Circular Dichroism and Luminescence Analysis”, F. Westerlund, P. Nordell, J. Blechingerb, Teresa M. Santos, B. Nordén, P. Lincoln, The Journal of Physical Chemistry B, 2008, 112, 6688-6694. Structural Studies on supramolecular adducts of cyclodextrins with the complex [Ru(aneS3)bpyCl]Cl, J. Marques, L. Anjo, M. P. M. Marques, T. M. Santos, F. A. A. Paz, S. S. Braga, J. Organometallic Chemistry, 2008, 693, 3021-3028. Binucler Ruthenium(II) complexes with polypyridil bridging ligands: Gas phase chemistry and ligand structure”, M. Graca Santana-Marques, J. Madureira, Teresa M. Santos, V. Félix, International Journal of Mass Spectrometry, 2008, 278, 20-25. Cyclodextrins improve the antimicrobial activity of the chloride salt of Ruthenium(II) chloro-phenanthrolinetrithiacyclononane, Joana Marques, Teresa M. Braga, Filipe A. Almeida Paz, Teresa M. Santos, Maria de Fátima Silva Lopes, Susana S. Braga, Biometals, 2009, 22, 541–556. A glycine ruthenium trithiacyclononane complex and its molecular encapsulation using cyclodextrins, Joana Marques, Teresa M. Santos, M. Paula Marques, Susana S. Braga, Dalton Trans., 2009, 9812-9819. [2,2´-bipyridine-k2 N,N´)(1,4,7-trithiacyclononane-k3S,S´,S´´)bromidoruthenium(II)] hexafluorophosphate, José A. Fernandes, Filipe A. A. Paz, Ana I. Ramos, Teresa M. Santos, Susana S. Braga, Acta Crystallographica Section E-Structure Reports on line, 2011, E67: m263. Investigation of the coordination modes of tris(pyrazolylmethane)/1,4,7-trithiacyclononane ruthenium(II) complex ions by electrospray ionization mass spectrometry, Raul A. Izquierdo, João Madureira, Catarina I. V. Ramos, M. Graça O. Santana-Marques, Teresa M. Santos, Internatiomal Journal of Mass Spectrometry, 2011, 301, 143-150. Solution and solid-state spectroscopic characterization of chloro dimethylsulfoxide polythioether ruthenium(II) complexes, complemented with DFT calculations in the gas phase, João Madureira, Teresa M. Santos, J. Coordination Chemistry, 2013, 66(5), 881-903. Reactions between Cr(VI) and wood and its model compounds. Part 1:a qualitative kinetic study of the reduction of Cr(VI), F. C. Jorge, T. M. Santos, J. P. de Jesus, W. B. Banks, Wood Science and Technology, 1999, 33, 487-499. Reactions between Cr(VI) and wood and its model com-pounds. Part 2: characterisation of the reaction products by elemental analysis, magnetic susceptibility and FTIR, F. C. Jorge, T. M. Santos, J. P. de Jesus, W. B. Banks, Wood Science and Technology, 1999, 33, 501-07. Fixation of Cr in wood from trivalent chromium salt solutions, F. C. Jorge, T. M. Santos, J. P. de Jesus, W. B. Banks, Holzforschung, 1999, 53, 465-473. Mesoporous silicas modified with dioxo-Mo(VI) complexes: synthesis and catalysis,P Ferreira, I. Gonçalves, F Kühn, AD Lopes, M. Pillinger, A. Pina, M. A. Martins, A. A. Valente, J. Rocha, C. C. Romão, A. M. Santos, Teresa M. Santos, Eur J Inorg Chem, 2000, 2263-2270. Synthesis and Characterisation of Ruthenium(II) Complexes Containing Ferrocenyl-Derived Ligands, C. D. Nunes, T. M. Santos, H. Carapuça, M. Pillinger, J. Madureira, W-M. Xue, F. Kühn, I. Gonçalves, New J Chem, 2002,1384-1388. Incorporation of a (cyclopentadienyl)-molybdenum-oxo-complex in MCM-41 and its use as a catalyst for olefin epoxidation, M. Abrantes, S. Gago, A. A. Valente, M. Pillinger, I. S. Gonçalves, T. M. Santos, J. Rocha, C. C. Romão, Eur J Inorg Chem, 2004, 24, 4914-4920. Zn-Al layered double hydroxide pillared by different dicarboxylate anions, S. Gago, M. Pillinger, T. M. Santos, I. S. Goncalves, Ceramics-Silikaty, 2004, 48 (4): 155-158. Synthesis and characterization of a manganese(II) acetonitrile complex supported on functionalized MCM-41,S. Gago, Y. Zhang, A. M. Santos, K Köhler, F. Kühn, J. A. Fernandes, M. Pillinger, A. A. Valente, T. M. Santos, P. Ribeiro-Claro, I. Gonçalves, Microporous and Mesoporous Materials, 2004, 76(1-3), 131-136. Immobilization of oxo-Mo species in a LDH pillared by 2,2´-bipy-5,5´-dicarboxylate anions, S. Gago,M. Pillinger, A.A. Valente.T. M. Santos, J. Rocha, I. Gonçalves, Inorg Chem, 2004, 43(17), 5422-5431. Synthesis and properties of Zn-Al layered double hydroxydes containing ferrocenecarboxylate anions, S. Gago, M. Pillinger, T. M. Santos, J. Rocha, I. S. Gonçalves, Eur J Inorg Chem,2004,1389-1395. Synthesis, characterization and catalytic studies of bis(chloro)dioxo molybdenum(VI)-chiral diimine complexes, S. Gago, J. E. Rodriguez-Borges, C. Teixeira, A. M. Santos, J. Zhao, M. Pillinger, C. D. Nunes, Z. Petrovski, T. M. Santos, F. E. Kuhn, C. C. Romao, I. S. Goncalves, J. of Molecular Catalysis A-Chemical, 2005, 236 (1-2): 1-6. Immobilization of lanthanide ions in a pillared layered double hydroxide, S. Gago, M. Pillinger, R. A. S.Ferreira, L. D. Carlos, T. M.Santos, I. S. Goncalves, Chem. of Materials, 2005, 17(23), 5803-5809. Highly luminescent tris(beta-diketonate)europium(III) complexes immobilized in a functionalized mesoporous silica, S. Gago, J. A. Fernandes, J. P. Rainho, R. A. S. Ferreira, M Pillinger, A. A. Valente, T. M. Santos, L. D. Carlos, P. J. A. Ribeiro-Claro, I. S. Goncalves, Chem. of Materials, 2005, 17(20), 5077-5084. Synthesis and characterization of layered double hydroxides intercalated by an oxomolybdenum complex, S. Gago, A. S. Dias, B. Monteiro, M. Pillinger, A. A. Valente, T. M. Santos, I. S. Gonçalves J. Phys. Chem. Solids, 2006, 67, 1011-1015. Study of selectivity of metal phosphates and phosphonates in Bayer-Villiger oxidations, Graça M. S. R. O. Rocha, Teresa M. Santos, Cláudia S. S. Bispo, Catalysis Letters, 2011, 141, 100-110. 2014, BIOMETALS, 27, 3, 507-525. 2013, JOURNAL OF COORDINATION CHEMISTRY, 66, 5, 881-903. Ferreira, M.; Santos, T.M. & Pereira, M.L. 2013, Microscopy and Microanalysis, 19, S4, 47-48. 2011, CATALYSIS LETTERS, 141, 1, 100-110. 2011, INTERNATIONAL JOURNAL OF MASS SPECTROMETRY, 301, 1-3, 143-150. 2011, ACTA CRYSTALLOGRAPHICA SECTION E-STRUCTURE REPORTS ONLINE, 67, M263-U1671. 2010, EXPERIMENTAL AND TOXICOLOGIC PATHOLOGY, 62, 4, 391-404. 2010, ACTA CRYSTALLOGRAPHICA SECTION E-STRUCTURE REPORTS ONLINE, 66, M1575-U868. 2009, BIOMETALS, 22, 3, 541-556. 2009, DALTON TRANSACTIONS, 44, 9812-9819. 2008, JOURNAL OF PHYSICAL CHEMISTRY B, 112, 21, 6688-6694. 2008, INTERNATIONAL JOURNAL OF MASS SPECTROMETRY, 278, 1, 20-25.